Many of my earliest memories revolve around the kitchen of my country childhood. With its constant comings and goings, the kitchen was the centre of my mother’s world and the heart of our farm. From daybreak until late into the night, it was where we gathered, talked, cooked and ate … where there was always a homemade biscuit in the tin, ABC blaring on the radio, and someone popping in for afternoon tea. It was a comfortable, secure cocoon filled with love, food, and activity, a high-traffic place that we ran into with fresh mulberries, buckets of mushrooms or a lemon from the tree, and out again with a square of caramel slice or slice of warm chocolate cake. In summer, the kitchen was invaded by the smell of apricot jam bubbling in enormous pots on the stove; there were buckets of peas to be shelled and tomato sauce to make. On lazy days I gorged on figs under the shade of the fig tree while reading Enid Blyton. Come winter, there was always something simmering away on the stove top to slurp a spoonful of – pea and ham soup or a lamb stew that filled the house with its sweet, reassuring aroma. The stove was where we warmed our hands after the walk home from the school bus stop and cooked pikelets on the hot plate. From the oven came the smell of cakes baking for the shearer’s smoko or a sticky, slow-roasted leg of mutton. With food shaping my childhood, it seems only natural that still today I remember days and places by what I have eaten. Food is my memory stick. As I take a bite in my mind, the setting, the people, the menu and minute details of time and place appear on the stage set in my head, brought alive by taste, aroma, texture and flavour. One bite can evoke so much emotion. Dreaming of a picnic will undoubtedly whisk me back to that blissful summer day under a cherry tree on a hill in Provence; the thought of a cream-cheese and lox bagel can carry me straight back to 1990s Manhattan, to the morning queue outside the delicious smelling H&H Bagels on the Upper West Side. And while Spain immediately conjures fragrant pans of paella at breezy beach shack restaurants, I see crusty baguettes and luscious raspberry tarts when I think of France, and tangy gelati in Italy. Some authors write simply because they have to write. I write because when I come across a taste, a custom, a place or culture that excites me I have an overwhelming desire to share it and preserve the memory. This passion has left a trail of trips and features in glossy magazines and newspapers and has led to the penning of A Family in Paris and Delicious Days in Paris. I find it impossible to say which I love most, food or travel, or to separate the two, for I find them intrinsically linked. A cuisine is wrapped in a place, a culture and its history as tightly as fish and chips are wrapped in paper. Growing up in rural South Australia, it wasn’t until I was 19 that I first travelled overseas, to Bali with my nursing friend Shaz. I’ll never forget descending the steps of the Garuda plane to be plunged into air that was thick, hot and wet, and hurled into an exciting world of tuk-tuks and incense, richly-coloured sarongs and satays with peanut sauce. I was totally besotted. Back then, in the early ’80s, Bali was far less commercial, and I was introduced to a whole new way of living and eating. My world had to be re-learned, and for me, that was (and still is) the biggest thrill of travelling, for when you mislay yourself you change the way you experience the world. Faced with customs, tastes and aromas so foreign and exhilarating, I couldn’t get enough. Years on, I still can’t. Down the track, after living in Adelaide, Melbourne and New York, it was Paris that finally stole my heart, a place that I both lost myself and found myself in. Living in another culture changes one’s perception of the world, of others, of oneself. It enlarges and enriches, shapes and challenges. Life becomes one of exploration where you are constantly questioning and growing, looking backward and forward, and comparing. After six years in the City of Light and raising children under the shadow of the Eiffel Tower, I still find myself inexplicably drawn to all things French. Paris is beautiful, inspiring, stimulating and addictive. Currently, I live in Adelaide, South Australia, a city known for its fabulous food and wine, sunny climate and relaxed Mediterranean lifestyle. Through Knife & Fork in the Road I want to invite you into my world and take you on trips around the corner as well as back in time to my country childhood. I will also whisk you away to my other favourite city, Paris. There will be musings and discoveries but most of all I want to tempt you and make you dream. So pour yourself a glass of wine, pick up your fork and tuck into a range of epicurean adventures, nostalgic food tales and bespoke travel experiences. Merci et bon voyage! The content on this site is unique, original and produced by moi. I only write about my personal experiences in my own voice and I do not publish guest posts. I am not a professional chef or food reviewer and my views are my personal opinions. Posts reflect my own experience on one particular day. I write from the heart, on my own terms. I find it impossible to write about something or somewhere I have a lukewarm passion for, or I do not believe in. It is necessary that I feel an authentic connection and a natural desire to share a story – otherwise writing becomes very hard work. For this reason, almost all of the stories on Knife & Fork in the Road have been self-funded and independently arranged. On rare occasions, I dine as a guest or stay in hotels on a comp or media rate. These will always be explicitly stated on the post and carefully selected. I do not believe in slamming someone’s livelihood and business in print. If it were that lousy, I would rather not write about it at all. Knife & Fork in the Road’s content and photos are copyright protected. 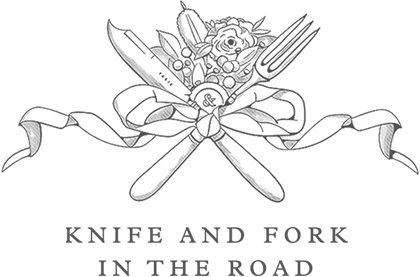 © Knife & Fork in the Road 2013-2015. All rights reserved.